Morning RGL readers! Apologies if you've been having trouble accessing the site, hopefully it should be working again now. 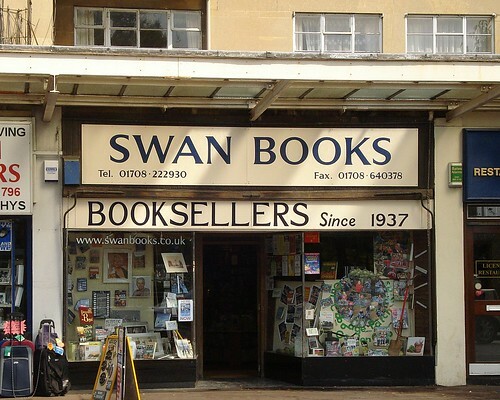 We're rounding off the year with Swan Books in Upminster as our featured article. 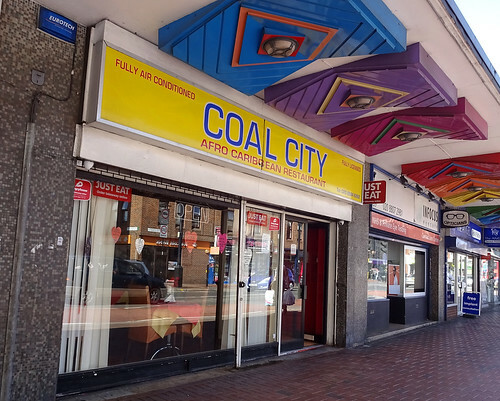 They've got a large children's section, plenty of local history books to peruse, and as you can see from the photo above, a cavalcade of different fonts on their shop frontage. There are new pages for two small cafes: Roome, a smart establishment in Herne Hill with large teapots but small cup handles, and the New York Deli, situated not in New York but a mere 3,747 miles away in sunny Dartford. 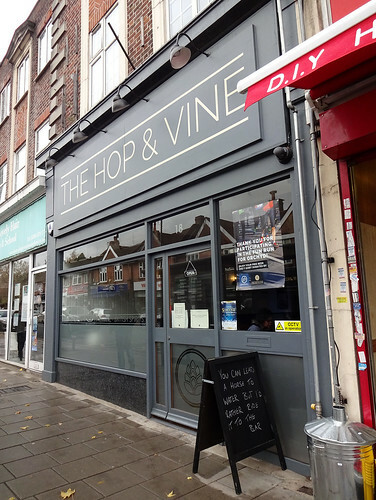 The Black Horse in Bexley has had an update following a visit to make sure the carpet is still there, while after multiple name and location changes, vegan cafe Vitao on Oxford Street has now closed. Finally, the Panton Street Odeon has reopened as the Odeon Luxe Haymarket. Apparently it will stick to showing the more unusual cinematic releases, as it did before, but you can now enjoy them while sat in an expensive-looking reclining chair. That's it from us until 2018 - see you then! 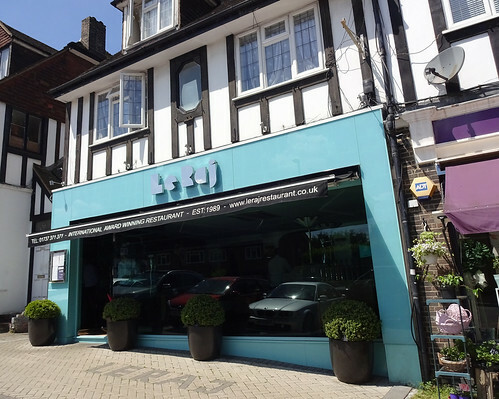 This week's featured article is for Le Raj in Epsom, a fancy joint that's earned a spot in the Good Curry Guide. 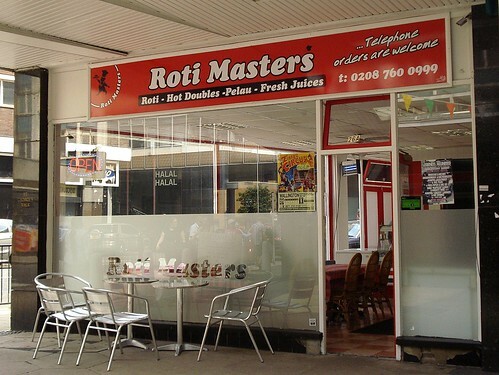 The takeaway prices are a bit lower but you'll have to come and get it yourself, as they don't deliver. New to RGL but certainly not new to me is the Soldier's Return, the third best pub in Ickenham. It's changed a little since I was drinking cheap lager there in the '90s - the tie's changed from Courage to Greene King, and they've apparently got rid of the (really quite manky) carpet. 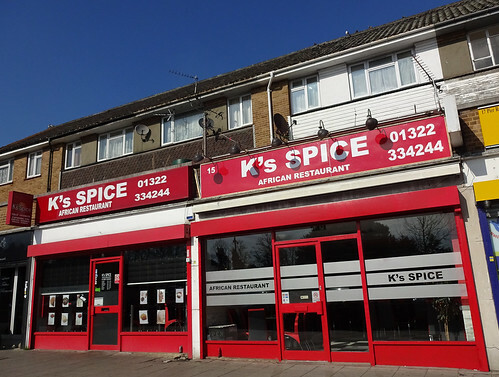 Also new is Karachi Cuisine in Norbury, a child-friendly Pakistani restaurant that does an interesting-sounding traditional breakfast on weekends. Try the chickpeas! Finally, the Michelin-starred Dabbous in Fitzrovia has shut. Apparently the team will be opening a new (hopefully less noisy) restaurant next year. 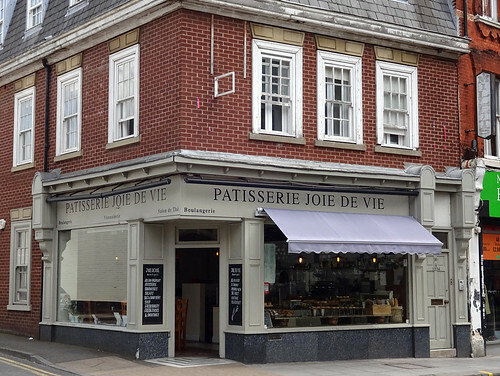 This week our featured article is the very French-sounding Patisserie Joie De Vie, EN5 5SN. It's unclear how joyful life will seem by the time you get to High Barnet, but at least once there you can have a crepe or a galette, which surely will help. 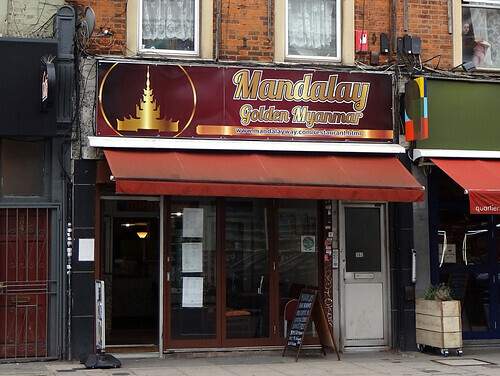 There's a new article in the form of Lahpet, a Burmese restaurant in Hackney. I believe the names "Burma" vs "Myanmar" are somewhat political, but as I have no idea what the adjectival form of Myanmar might be, I'm glad the former has been chosen. If you, like I, are unfamiliar with the country's food, then a visit to Hackney may be required, though you may need some patience with the food it sounds like. There are updates to Shadi Bakery in Croydon (for all your fresh naan needs), Kazan in Westminster (for all your quality Turkish food needs, assuming you don't mind paying a bit more), and Village Bookshop in Woodford Green (for at least some of your book needs). There's a reported upcoming closure for Dabbous; their final day is 15 July. I guess its period of on-trend success just fizzled out? Finally the old Chesham Brewery Shop is now called Mad Squirrel Chesham following the renaming of its parent brewery from Red Squirrel to Mad Squirrel. Best of luck with the new name. 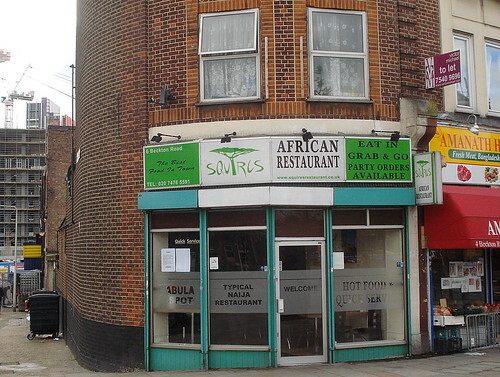 This week's featured article is for Squires, a Nigerian restaurant in Canning Town serving at least two different types of pounded yam! 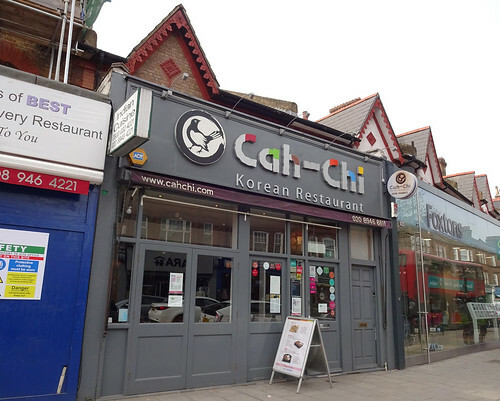 I couldn't say if this is a 'typical Naija restaurant' as stated in the window but there are branches dotted around East and South London if you want to find out for yourself. 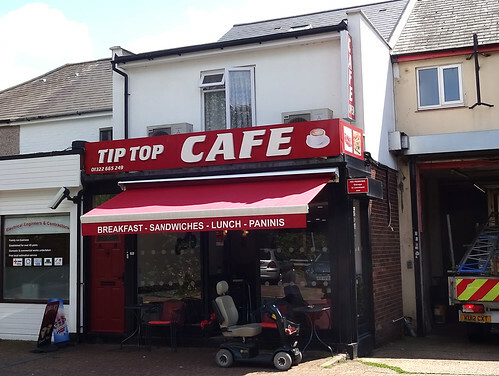 If your prefer a cup of tea in Forest Hill instead, we have a new page for the Teapot cafe, which does a decent panini too. Pub news! 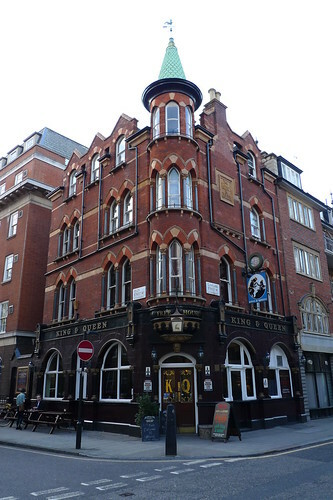 Famed Fitzrovia pie-haunt the Newman Arms is shut for a refurb, as is the Duke of Argyll (a Sam Smiths) in Soho. The Dartmouth Arms in Tufnell Park, the Widow's Son in Bow, the Lucky Rover in Chessington and the Great Northern Railway Tavern in Hornsey have all recently reopened - the latter is now owned by Fuller's, so expect the beer selection to be a little different. However: the great pub deity giveth, and it taketh away again. The Taylor Walker-owned Devereux has shut, as has the Three Horseshoes in Southall. 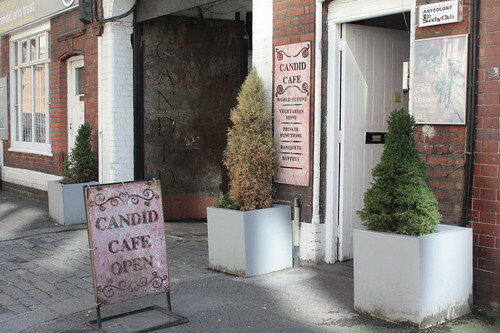 Also closed for good is Canal 125 on the Caledonian Road, once home to various club nights run by denizens of Livejournal. As small venues go it was pretty terrible, and I'm amazed it kept going that long. Let's hope whatever replaces it is better! Hullo RGLers! 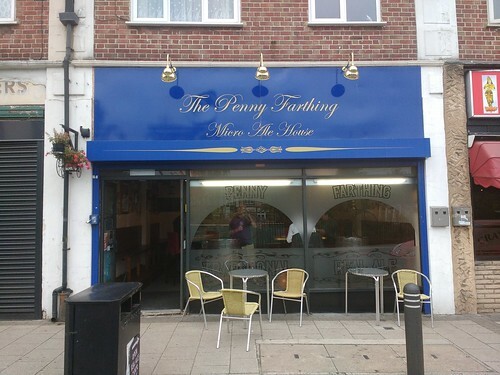 This week's featured article is for the Penny Farthing, a friendly micropub in Crayford, with plenty of real ale and real cider. If you happened to be walking from Wroxter to Canterbury along the old Watling Street Roman road, it would be a perfect 162-mile pint pit-stop. 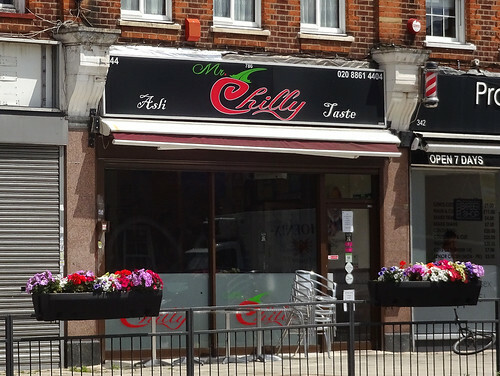 There are a couple of new pages, one for Potli in Hammersmith, a reasonable Indian restaurant/takeaway, and one for Cafe Shack, a greasy spoon in Old Coulsdon (decent deep-fried sausage but maybe give the milkshakes there a miss). Mayfair lost a couple of Michelin stars in October with the closure of Hibiscus - I had a cracking bowl of soup there once. I never had a decent bowl of soup from the Chiswick branch of Oddbins, but that's closed too. Finally, Lancaster Gate tube station is shut until July, while they sort out the lifts. 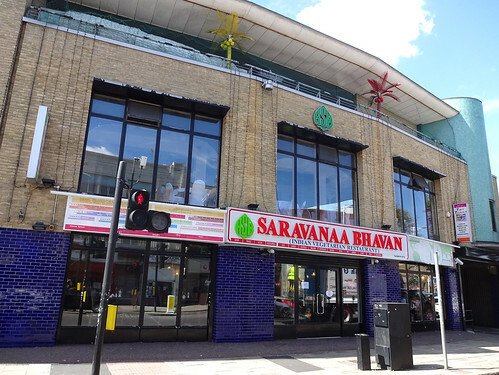 This week's featured article is Saravanaa Bhavan, IG1 4PU in sunny Ilford. 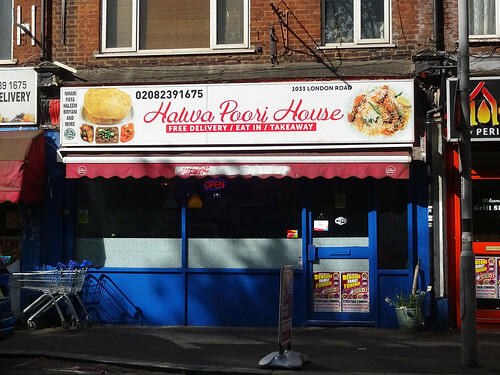 It's part of an international vegetarian Indian chain, and maybe you've been to one of the other London branches in East Ham or Tooting? Ganesha will watch peacefully over your dosa eating if you visit this spacious branch. Other additions are a shabby pub/restaurant in Worcester Park/Cheam called The HG Wells, a Nigerian restaurant called Coal City in Edmonton (why not surprise the staff by visiting), and Chang's Noodle in London's fashionable Chinatown (excellent quality, and expect more than one noodle). 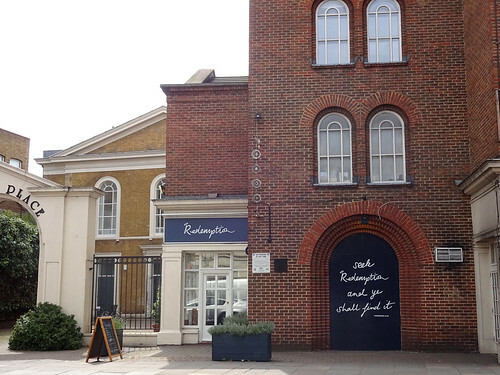 There's an update to The Gilpin's Bell in Edmonton, now under non-Wetherspoons ownership, but still offering Ruddles and similar cask beers. Reported closures are Arbutus (always a bastion of unpretentious Michelin-starred fine dining) and The Windsor Castle in Marylebone (a bastion for the moustachioed gentleman). Finally a couple of reopenings are The Fitzroy Tavern in Fitzrovia, and One and One Chinese buffet in Angel (now with meat, bucking the trend towards veganism). Evening all! 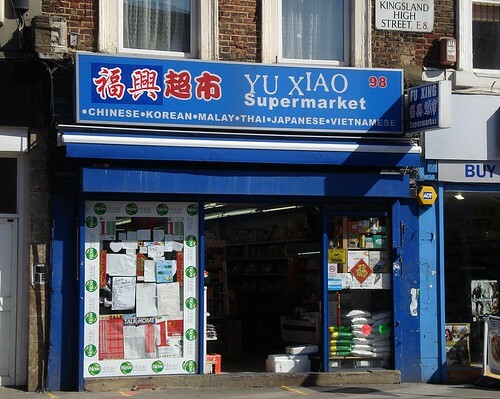 A bumper week, kicking off with this week's featured article Yu Xiao, a Chinese supermarket on Kingsland High Street (right near Dalston Kingsland Overground station). It's stuffed full of noodles, pickles, tofu and other East Asian groceries. Our old peripatetic friend the Japan Centre (currently located in Shaftesbury Avenue) has had an update. A slightly different selection of tofu, noodles etc is available there, as well as a vast number of magazines with Japanese boybands on the cover. The Blythe Hill Tavern in Catford has also had an update, including some useful #limeandsodawatch pricing info. There are plenty of new pages this week, including three fully vegetarian eateries: the Lighthouse cafe in Catford, Indian restaurant Saravanaa Bhavan in Ilford, and the awkwardly-portmanteaued CoffeE7 in Forest Gate. Guess which one has a chandelier! Also new is the Orbit Beers Taproom, just off the Walworth Road (good for train spotting), and Cappuccino in Norbury (good for fried eggs). 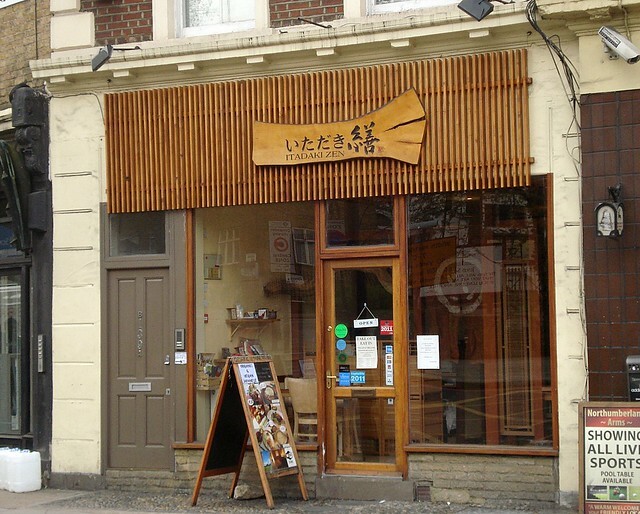 However fans of egg will no longer be able to obtain tarts from Sun Luen Snack Bar in Chinatown, as it has closed. Finally, some cinema news: the Bromley Empire and Leicester Square Empire are now Cineworld Bromley and Cineworld Leicester Square respectively.